Reducing traffic on congested streets, clearing pollution from smog-laden overcast skies, and completing that last kilometer to your destination from transit points are the accepted benefits of bike-sharing no matter the political situation or location in the world. Bike-sharing has become an integral part of many cities' green economy. It comes as no surprise that even in the Islamic Republic of Iran, bike-sharing is thriving. Tehran’s “Bike House” bikes are rolling across the city. The system, less than a year old, is funded by Tehran’s municipal government. It is currently only in one of Tehran’s 22 administrative districts. Although a 2nd generation system, there are 12 “Houses” in this district, each with around 40 bikes. The yearly subscription cost is the equivalent of $2 US, and allows the use of a bike for up to four hours at a time. In less than a year, there have been 6,000 subscriptions sold. There are larger 3rd generation systems in the world, which do not have a subscription to bike ratio as big as that. For many, “Bike House” has made travel through the congested streets of Tehran fast and convenient. Unfortunately, because of Islamic and cultural considerations, women can only be green with envy because they not allowed to participate in this bike-sharing! 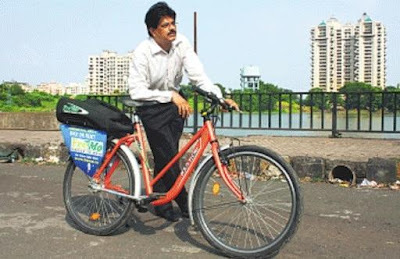 India has its first bike-sharing service with FreMo, or Freedom to Move, in Thane, outside of Mumbai. FreMo was created by entrepreneur V. Ramesh to be a profitable business that successfully fights climate change. 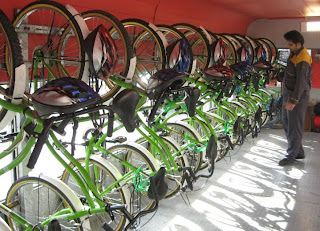 This service has six indoor "stations" and a fleet of 100 bikes. Subscribers get a smartcard upon registering and may also borrow a helmet before leaving a station. Ramesh was first exposed to bike-sharing when visiting Barcelona where he saw Bicing. "The idea appealed to me so much that I quit my job in the financial sector and devoted the whole year to ground research for this project," said Ramesh to Hindustan Times. Being a for-profit business, FreMo has a different pricing model than is commonplace with other services. FreMo offers multiple pricing plans to provide his customers options for varying needs of use. The one-time registration fee is 499 rupees ($11 USD), an annual membership fee of 199 rupees ($4.34 USD), and a variable usage fee based on the selected plan of 0.08 - 0.30 rupees (less than $0.01) per minute.